Aftershocks: so far (29 Jan 2018, 08:12AM PST) there have been 27 aftershocks recorded, the largest M3.1 (smallest M0.3). More may be expected in the next few days, the largest expected is approximately 1 magnitude unit smaller than the mainshock. There is a small chance (about 5%) that a larger quake could occur, with the likelihood decreasing over time. There was 1 event during the 3 days prior to the earthquake (within a 10 km radius), with M1.2 (2018/01/22). 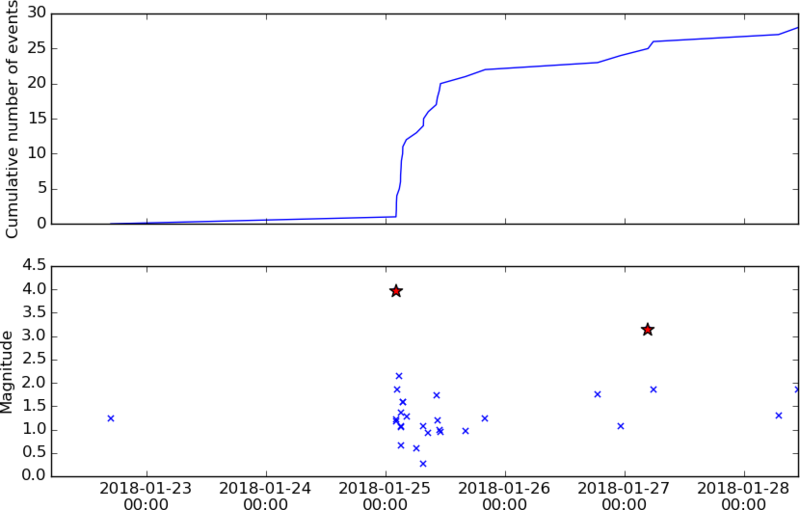 Plot of seismicity through time, from 3 days before the M4.0 Trabuco Canyon event to approximately 3.5 days after. Top plot shows cumulative earthquake count against time. Bottom plot shows earthquake magnitude against time, the M4.0 event and M3.1 aftershock are plotted as red stars. Historical seismicity: since our records began in 1932 we’ve had 7 events of M4 or greater within 10km of today’s event, the largest was M5.2 (1938/05/31) and the most recent was M4.7 on 02 Sep 2007. 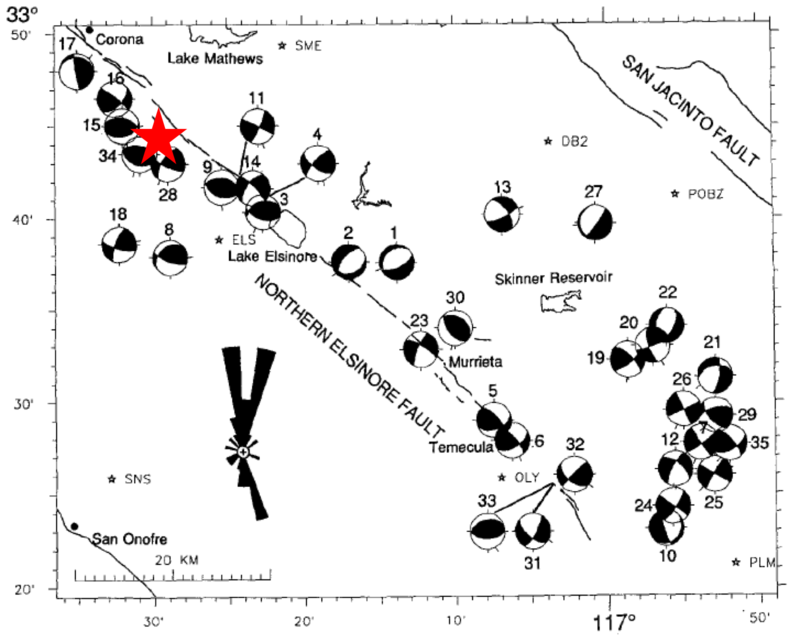 Map showing the M4.0 earthquake near Trabuco Canyon (red star) with foreshocks and aftershocks in a 10km radius shown as circles colored by time (blue = early, red = late) and sized by magnitude. Grey stars labelled by magnitude show historic earthquakes. Grey lines show the mapped fault strands in the Elsinore fault zone. Mechanism: the event has a thrust mechanism on a near east-west trending fault plane as shown by the moment tensor below. Moment tensor for the M4.0 event on 25 Jan 2018 near Trabuco Canyon. The nearest mapped faults to this event are in the Elsinore fault zone, most strands of which usually host strike-slip events. However, the Glen Ivy strands of the Elsinore fault show oblique as well as strike-slip mechanisms (as shown below), and in the region north of Lake Elsinore it is thought the fault may form a restraining bend at depth contributing to uplift of the Santa Ana mountains (Hull & Nicholson, 1992) and consistent with thrust mechanisms such as the 2018/01/25 earthquake. 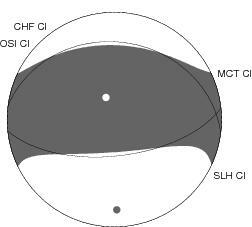 Figure from Hull & Nicholson (1992) showing focal mechanisms for selected earthquakes from the Elsinore-Temecula trough. 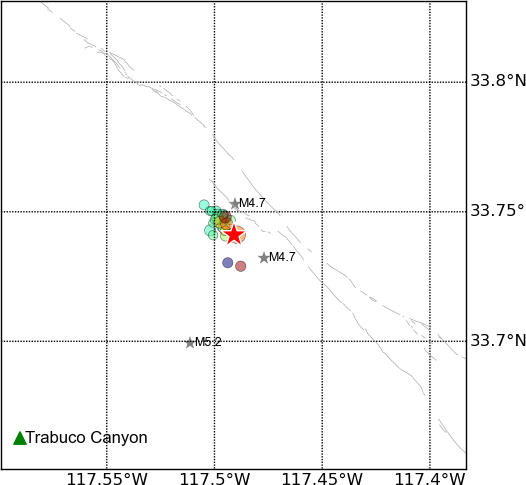 The M4.0 event on 25 Jan 2018 near Trabuco Canyon has been added as a red star, and shows a consistent mechanism with earlier observed earthquakes. Nearby faults: Elsinore fault zone, Glen Ivy section (Glen Ivy South fault) (0.9 km), Elsinore fault zone, Glen Ivy section (Glen Ivy North fault) (1.4 km), Elsinore fault zone, Temecula section (Willard fault) (2.0 km), Elsinore fault zone, Glen Ivy section (Eagle fault) (5.6 km), Elsinore fault zone, Glen Ivy section (Main Street fault) (10.7 km), Elsinore fault zone, Chino section (Chino fault) (12.8 km) and Elsinore fault zone, Temecula section (Wildomar fault) (13.1 km). The ShakeMap (below) shows that ground shaking was strongest to the north and east of the earthquake hypocenter, consistent with stronger shaking being felt in basins and valleys (generally weaker geology, greater chance of amplification effects), and potentially also an effect of source mechanism. ShakeMap for the M4.0 event on 25 Jan 2018 near Trabuco Canyon. Hull, A.G. & C. Nicholson, 1992. Seismotectonics of the Northern Elsinore Fault Zone, Southern California. Bull. Seismo. Soc. Am. 82 (2) pp. 800-818.